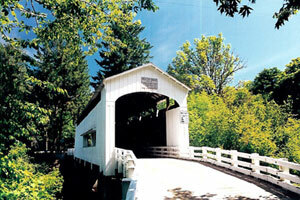 Travel 33 miles west of Eugene on Oregon Highway 126 to Whitaker Creek /Clay Creek Recreation Area turnoff. Exit the highway on the south side and follow the road back under the highway and railroad tracks (north) a short distance to the bridge. The Wildcat Bridge is located on a small winding road a short distance from Highway 126. From the bridge site where Wildcat Creek flows into the Siuslaw River, Stagecoach Road hugs the hillside until it drops into the narrow plain at Swisshome. Stagecoach Road was the original road to the coast, but was bypassed after the Linslaw Tunnel and Mapleton Bridge were built in the 1930s. The nearby Austa boat ramp provides access to the river for fishermen on the Siuslaw River. The bridge was closed for repairs several times in the 1980s and in the autumn of 2000, when the structure was strengthened.